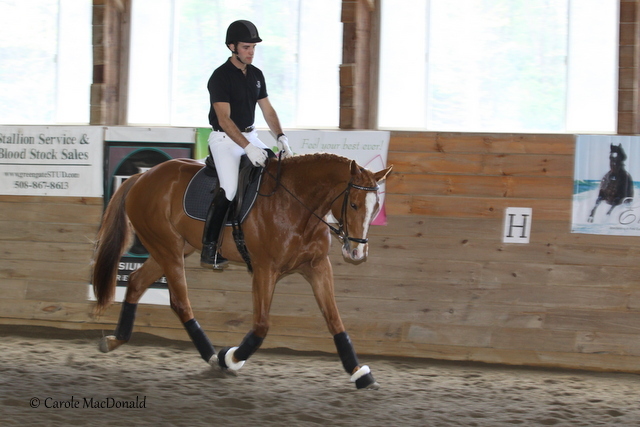 A Second Chance - Maverick Hill Dressage LLC. Thank you once again to Skye Reno of Salty Dog Productions for putting together this amazing video. The intent of this video is to show and to share that there is a life after racing for these stunning creatures! Given time, love and a confident handler there is just nothing Thoroughbreds can not do. If you are interested in becoming involved or if you are looking for a Thoroughbred, please contact Jordan. Lady is currently owned by Sharon Lamb. 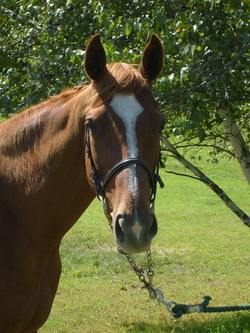 Lady was a very successful race horse who later became broodmare. She has embarked on her third career with Sharon, molding into an outstanding companion, dressage and pleasure mount! Willow was an outstanding example of a diamond in the ruff! She possessed such a kind manner and willingness to do the work. 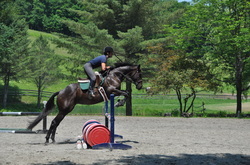 She was a blast to ride and train, taking a keen fancy to jumping! 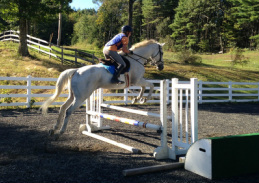 Willow is currently owned and loved by Amy Stewart of Woodstock, Vt where she is eventing, trail riding, and being doted over by Amy and your three yr. old son! Winter Vacation is currently one of Maverick Hill Dressage's brood mares. Winter took to being ridden as if she was trained her whole life. She was backed and taken to her first show with in three weeks and placed very well. She was never raced and to my knowledge never really ridden. 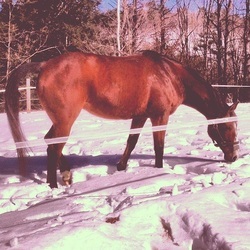 She is my best friend and I love this mare like no other! She has produced incredible foals for racing and is now producing top quality sport horses. She passed away 2017. Diorama aka "Taylor" was a special mare. She was a successful race horse as well as a stunning producer of excellent foals. She was a simple yet filled with life mare. Loved to be fussed over and one of the most comfortable OTTBs I have had the honor of sitting on. She passed away in 2013. Slew is a stunning bay mare! She is currently a broodmare for event rider Lisa Davidson. 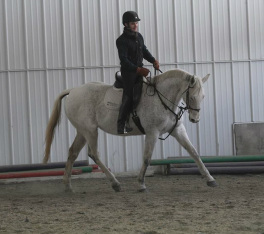 She has effortless power and suspension to her gaits. She is trained through second level and is currently producing sport foals with a keen eye on dressage as well as jumping. She is a love bug! 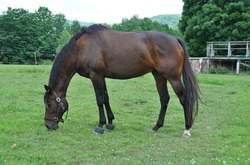 Ty is a retired race horse who is currently owned and loved by Lea Blackmore. The two have been together for just over a year now and have made leaps and bounds! Both are madly in love with jumping! Ty has been such a rock star for Lea, as she is learning the ropes! Its such fun seeing the two grow together. Diva is currently finding a new carrier as a momma. She was raced and quickly retired as she showed no interest in the speed aspect! She is currently residing at Cabin Hill Farm where she has become there newest addition to their breeding program. 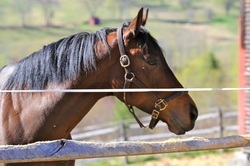 Cabin Hill Farm specializes in gypsy feathered sport horses. Big Bonus "Beau" was the horse that started it all! Beau, was a 16.3 hand powerhouse who became my closet and dearest friend. I was blessed to have him in my life for several years. His time was short on this earth, but in a few words profound. He gave me the confidence that I have to work with these outstanding retirees and he showed me that there is nothing love can't fix. He and I were one and I experienced the gift of partnership with Beau, that has molded me into who and what I am today as a trainer. Combining Passion with Partnership! Thank you Beau for everything. There is not a day that goes by I don't think of this horse. 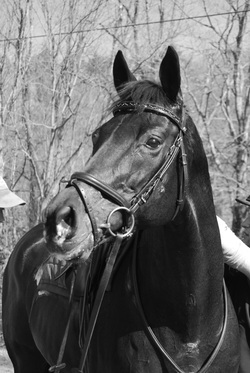 He was my once in a life time horse and I am blessed to have had the time with him I did.